This is more of a personal post, not a jewelry post. I am shocked that we are already at the end of October and on Sunday, just four days from now, it is going to be November. This year is heading toward the end and I am kind of taken by surprise. This year has flown by and the end of it is going even faster. I am finally feeling better but today had to have another shot in my right eye. I have been dealing with Occular vein occlusion since Jan and the injections have not been working so we started a new med today. I am hopeful this one will take care of the issue, which is inflamation in the eye and water leaking out of the vein behind the eye, the inflamation causes my vision to tunnel and everything is smaller in that eye and the water gives it all a watery appearance, so it is a pretty useless eye. Getting shots in the eye is not fun, but not as bad as it sounds. However, I will be very happy when it is done. Luckily the good eye does a great job compensating so it has not affected me that much overall. I also got back the results of my physical and I do have some thyroid issues, he will not treat it yet,he wants to watch it, but it explains my slight depression I think has been my problem. I am starting back on a very strict diet, avoiding the foods that can make it worse and eating the ones that can help. I am hoping to feel much better soon, and I am not happy with myself for slowly going off that diet when I knew it was helping. So, easy to do. So, a fairly low carb diet, no rice, or breads or wheat of any kind, avoiding sugar for the most part and corn, and lots of other foods that can cause issues. Not fun, but not as bad as it could be. The rest of the labs were great and I do attribute it to my low carb eating most of this year. Normal sugar and normal cholesteral which are a far cry from a few years ago when I had my last physical, which is a bad thing, I need to get in every year. Hubby is just as healthy and he was on the diet as well. So, we are going to really get back to eating much healthier and I hope to see my mood and energy change for the better again . Not an easy task with the holidays coming up, but we can have some treats, I just have to really watch it and we really do not mind the gluten free and even low carb treats. Gluten is the biggest thing I have to avoid so that is tough. I know it affects me on many levels, but especially the thyroid. I went from prediabetic to normal and my cholesterol was way up, like 270 a few years ago and I think 240 the last time and now it is under 200, so I am thrilled. So much of how we feel is based on how we live our life. Do we eat right, sleep enough, pay attention to what our body has issues with ? So many times it is just easier to ignore the situation and just do what we want, but it always catches up. Even though I had been on low carb, I was not avoiding the particular items that can irritate the thyroid, the cruciferious veggies and a many others , I was eating quite a lot of them. I have to face the fact I am in charge of my health, not my doctor and I have to do what is right to get my health where I want it. I am tired of being heavy, but thyroid, metabolic syndrome and menapause has really thrown a wrench in my losing weight. It is not impossible but I have to be very rigid in what I do and not make excuses and just do what I want. So, as this year ratchets down to the new year, I plan to work hard to get myself where I want to be health wise. I still plan to work. In fact tomorrow I am starting back up with my friend on a very exciting project so I will be sure to take lots of pictures and share them with you !! So, that is where I am today. Optomistic that things will get better and relieved to know why I have been feeling so badly the last few weeks. I am pretty tired from the eye thing but wanted to at least post today. here is a sneak peak for tomorrow !! Some pictures of our materials !! 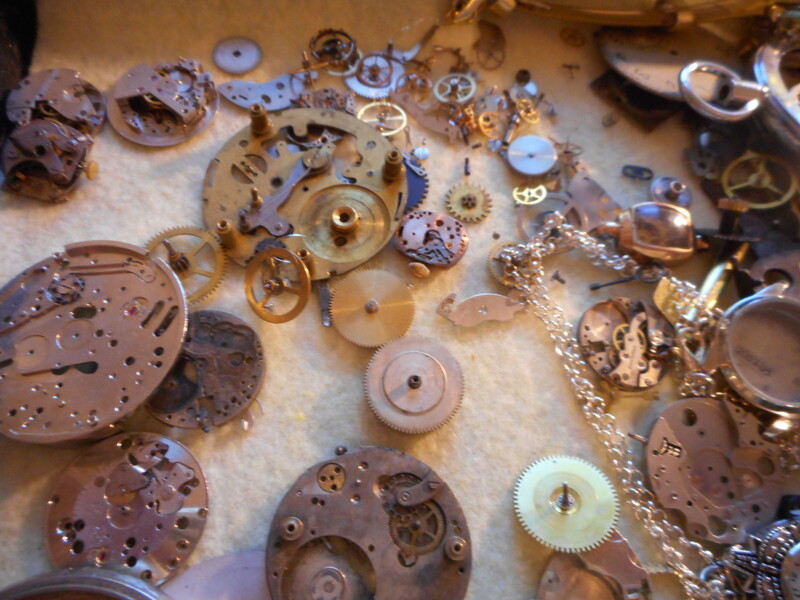 Hint, it is a steampunk project !!! I am very excited about this one, she is too, I cannot wait to share what we come up with !! We do this all long distance too !!! Yeah! 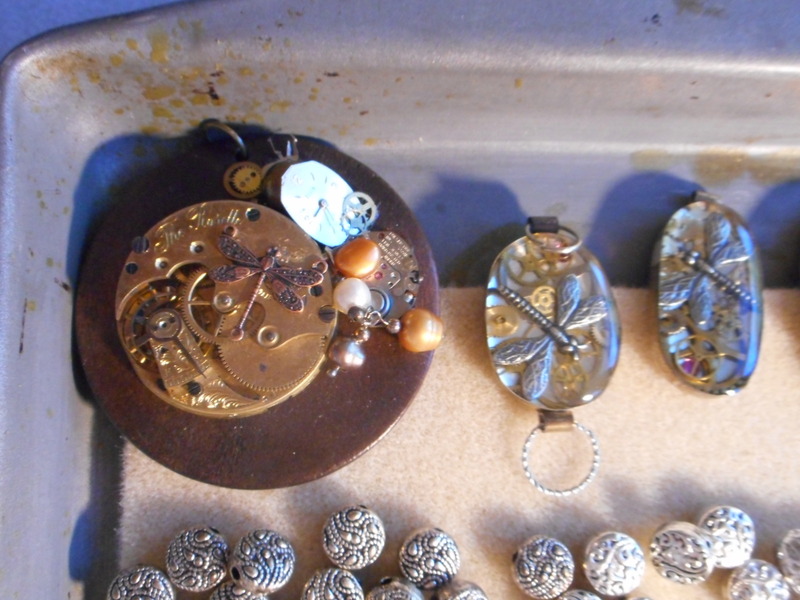 I love steampunk jewelry! So glad to hear that the majority of your results came back good. It definitely eases your mind, and answers some questions. To good health for the remainder of this year and to the new one! I know you can do it! Thanks so much and right back at ya !!! I wish you only the best of health through the new year as well !! I was thrilled with my labs. I was very worried because he has discussed drugs for the cholesterol if it had not come down, I was soooooo relieved I did not have to worry about that !! Great motivation for sticking to our plan !!! I am very excited about steam punk and she knew I was going to have a big smile on my face when I read her email and she was right !! I am very excited to start on this project tomorrow !!! Super news! Have a blast! Gosh I hope your health improves quickly. You are very brave to keep beading with your intense eye problems. Good luck with your project. All those shades of blue look so soothing and healing. Thank you so much for coming by !! My eye is not too bad, and hopefully the new med will help !! I sure hope so !!! I am so excited to be working with all the blues. The last projects we worked on were all purple and we had a blast. It is fun to have changed to blue !! I take a lot of pictures as I work, we work long distance and that is how we design together, so I will be posting as we go. I can fully appreciate how hard it is to change and then stay on a new lifestyle, Stephie. I hope that soon you’ll start feeling better and better, and will enjoy creating again. Hang in there, and remember that you’re surrounded by people who care about you. Trying to send strength your way. Thanks Linda !!! I am feeling better, the eye thing wipes me out for a couple of days, but it is not too bad. Sounds much worse than it is !! 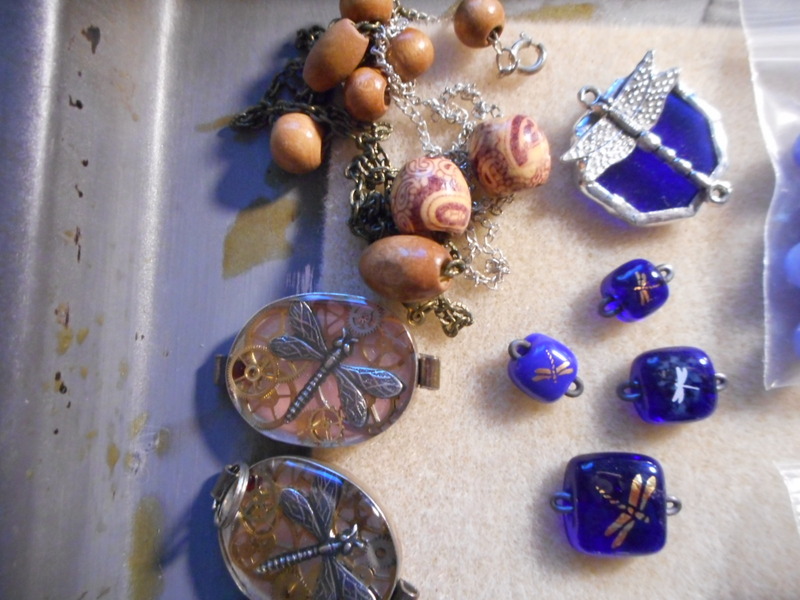 I have been making jewelry for costumes for our kids and grandkids, so that has been fun !!! Also, my friend and I started working on her new projects, we have been waiting for months to get started, so we are both very excited !! 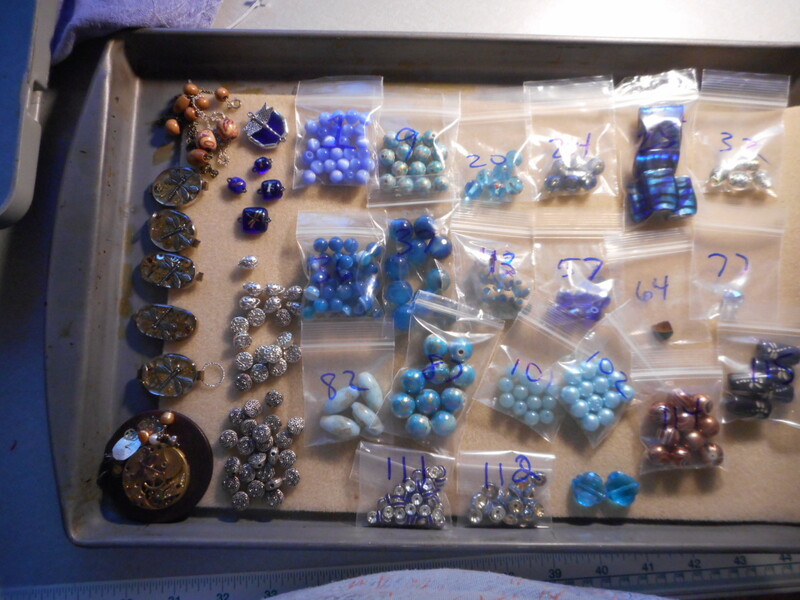 My pirate charm lady added 26 more pirate wine charms, so I have a lot to keep my busy !! I am ready to be on the diet. The hard part is the strict diet for the hypothyroid. It really cuts out a lot of otherwise healthy veggies that I now have to avoid . I have done it before and my eyebrows which had all but disapeared started to come back so I know it helps. So many foods on the goitregen foods list, and I adore most of them. I do notice a huge difference when I avoid them and my doctor has said I have a one in three chance of being on meds, so it is best to work at avoiding it if I can !! I can have anything on that list occasionally, but just not every day or even every week, just a treat occasionally. Cooked is better too. Also, every darn thing has soy in it, so that makes it a lot harder to eat, avoiding soy makes most anything not on my list, lol !! I am up to the challenge and ready to get rid of the next 20 pounds !! So, things are looking up and I am much happier and happy to be working on a lot of projects. sorry to hear about your eye problem! I hope things get better that certainly can’t be fun having shots in your eye! I also can relate to the eating issue and the weight! You are so right that we tend to look the other way and I have as well. I am glad you feel motivated to get back to eating healthy! I am really trying to get back to it as well! Love the jewelry plans! Can’t wait to see what you do with it! HI !!! ,I am so glad you dropped by !! I am taking a lot of pictures of the projects I am working on and when the first one is finished, I will post the during and after pictures !! It is a lot of fun designing long distance !! good luck with your weight loss too, it just takes time and dedication !! The shots sound much worse than they are !! He does them at the bottom so I am looking up and away and that helps a lot !! Not much discomfort from the shot, more discomfort from the prep and that discomfort lasts a few hours. Hopefully this med will work and I will only need a few more ! !